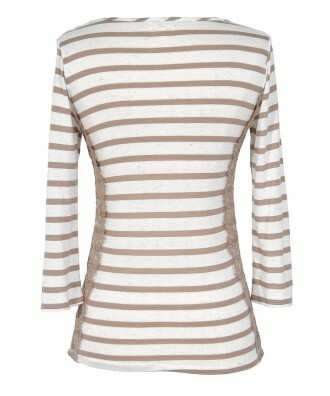 This mocha and ivory stripe top is better than all your other basic fitted tees. You’ll feel put-together and stylish instantly when you toss this top on. 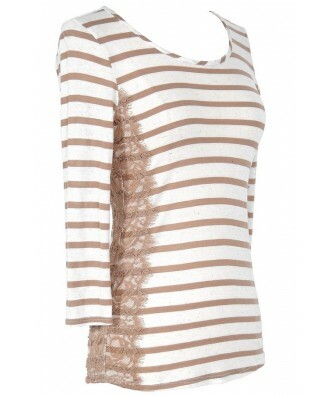 The Lace Side Mocha and Ivory Stripe Top has a rounded neckline and three quarter sleeves. It is made of an ivory and mocha/taupe striped fabric that is a bit thin—you may want to wear a fitted tank or cami underneath. The best part of this top has to be the mocha colored lace that decorates each side adding a girly touch to an otherwise simple top. The Lace Side Mocha and Ivory Stripe Top is perfect to pair with denim and mocha boots or a fitted jacket—this is a top you’ll love to wear over and over. Details: 67% rayon, 26% polyester, 7% linen. Hand wash cold. Do not bleach. Lay flat to dry. Small measurements: Length from top of shoulder to hemline: 24”. Bust: 30”. 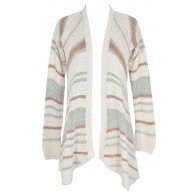 You have added Lace Side Mocha and Ivory Stripe Top into Wishlist. 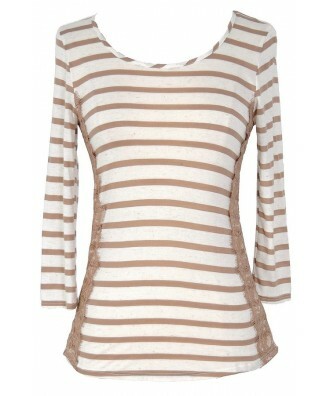 You have added Lace Side Mocha and Ivory Stripe Top for Stock Notification. 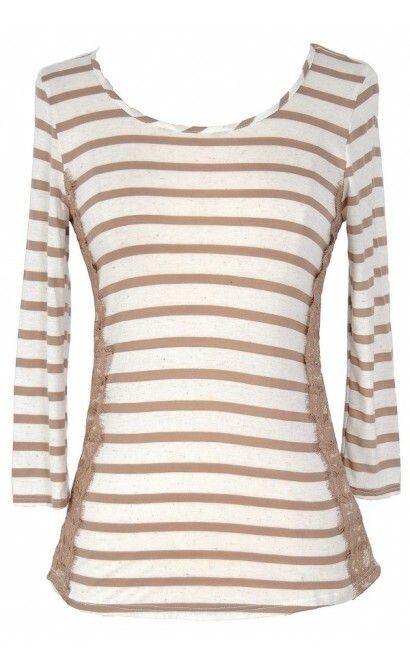 You have set Lace Side Mocha and Ivory Stripe Top as a loved product. 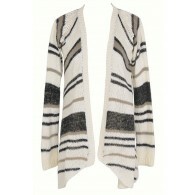 You have removed Lace Side Mocha and Ivory Stripe Top as a loved product.